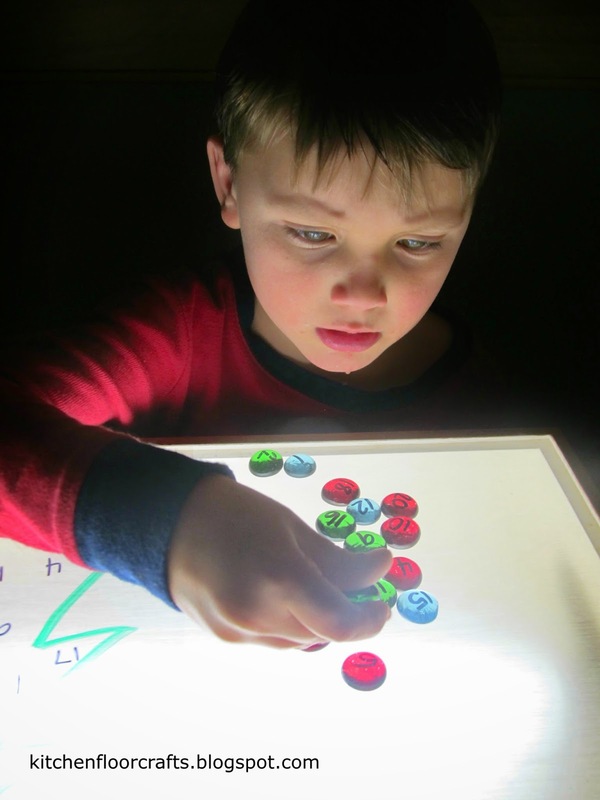 There's something about these dark days of December that instantly make us want to get out our light table to play. 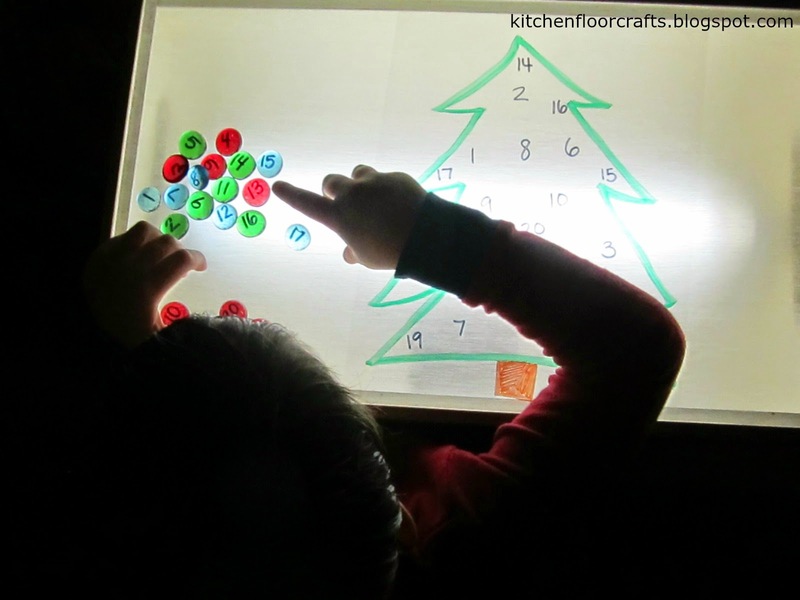 With the coming of Christmas we decided to do some holiday themed light table play and incorporated Christmas trees. We've done some alphabet play with the light table before with our light table letter match activity, so it was fun to try a number activity. Lately Big Brother has been really interested in numbers, reading them everywhere we go and trying to count to 100. The "teen" numbers still trip him up just a little when he's reading and saying them, although he's usually pretty comfortable by the time he gets to the twenties. I decided to make this activity be focused on the numbers 1 through 20. 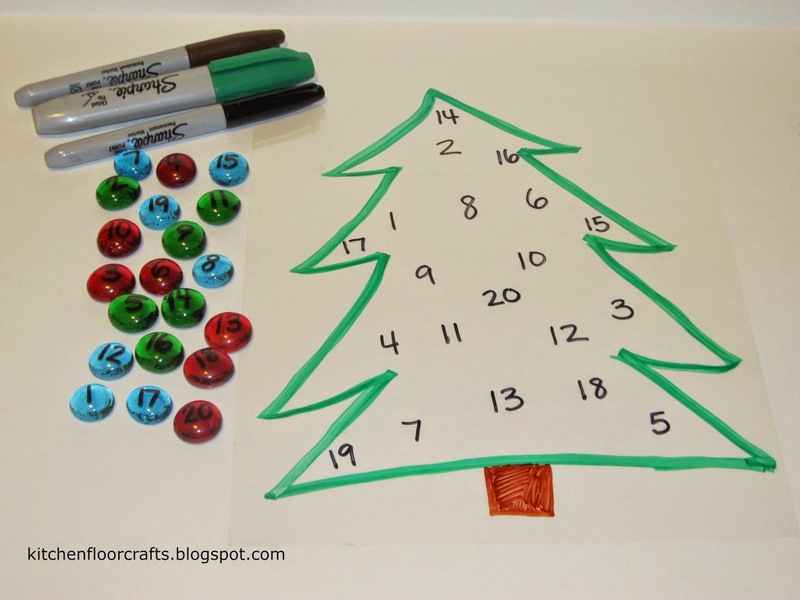 To create the activity I used clear projector paper, permanent markers, and flat marbles. I drew a tree with green marker onto the clear projector paper and wrote the numbers 1 through 20 on the inside of the tree. Using a black permanent marker I wrote the numbers 1 through 20 on to 20 different marbles. I set the paper up on the light table with the marbles all around it in a random order. Big Brother was instantly interested, and pretty quickly knew to do the activity. Before beginning he spent a little bit of time organizing the marbles so they would be easier to match. 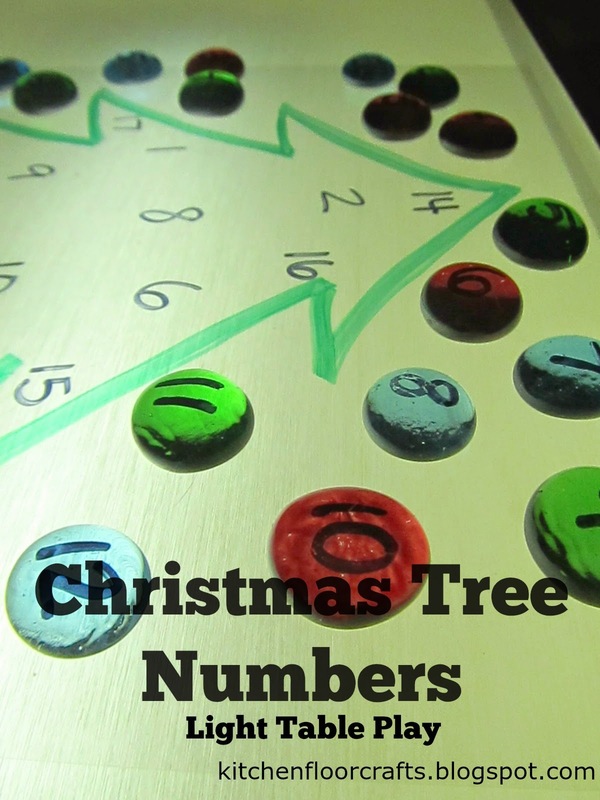 He then started matching the numbers on the marble to the numbers on the tree. He continued until he had numbers covered, and then pretty quickly moved them off and started again. 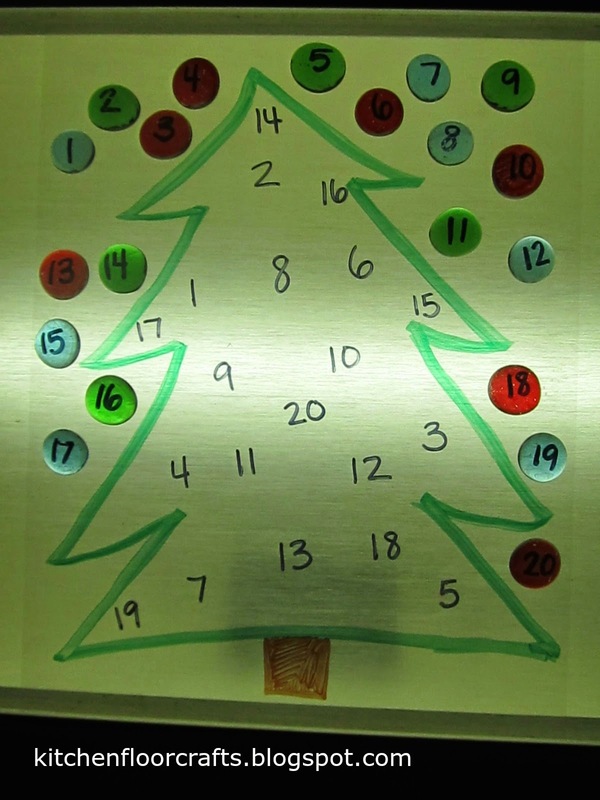 We've played with our Christmas Tree Numbers and light table a few more times this week. 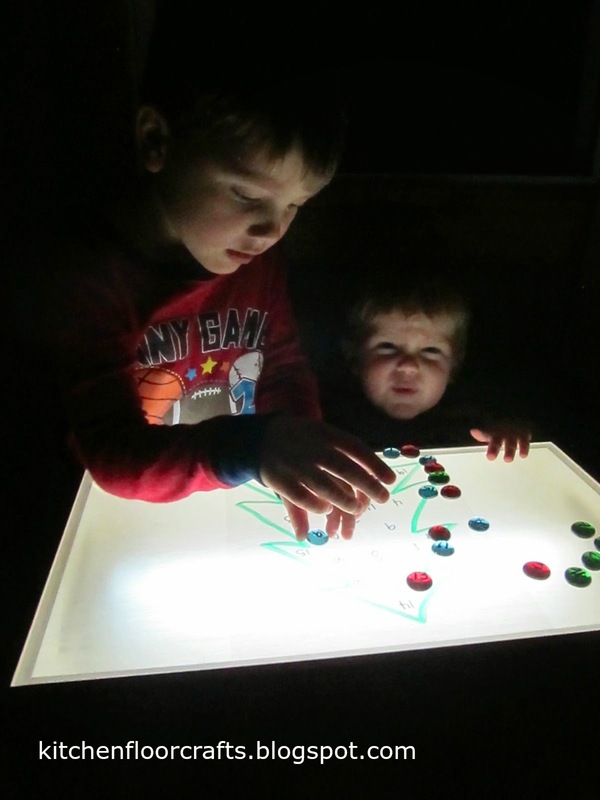 We'll be looking for more ideas for light table play as we continue with this dark, December light.